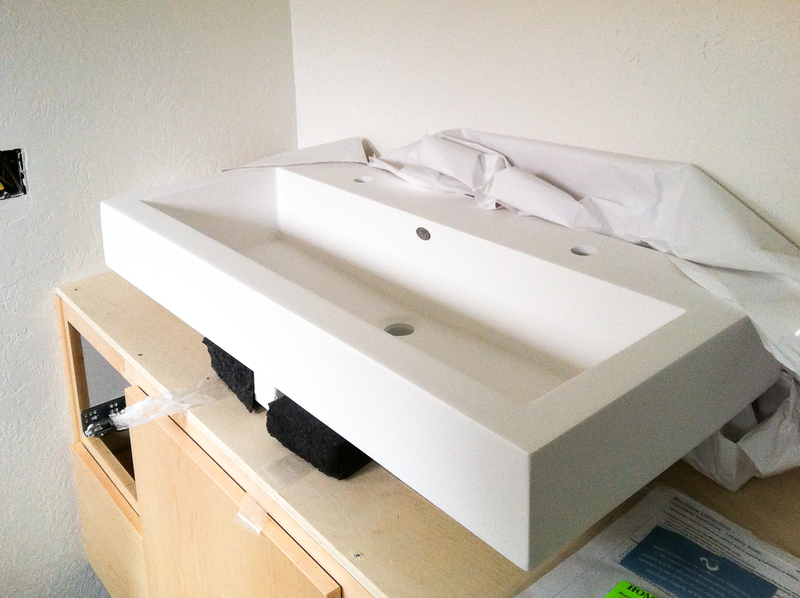 Our counter-guy needed to do the templating for the sinks, so my husband went down to Ferguson’s and picked up the sinks that had been ordered several weeks ago. He unwrapped them and placed them on the countertops. 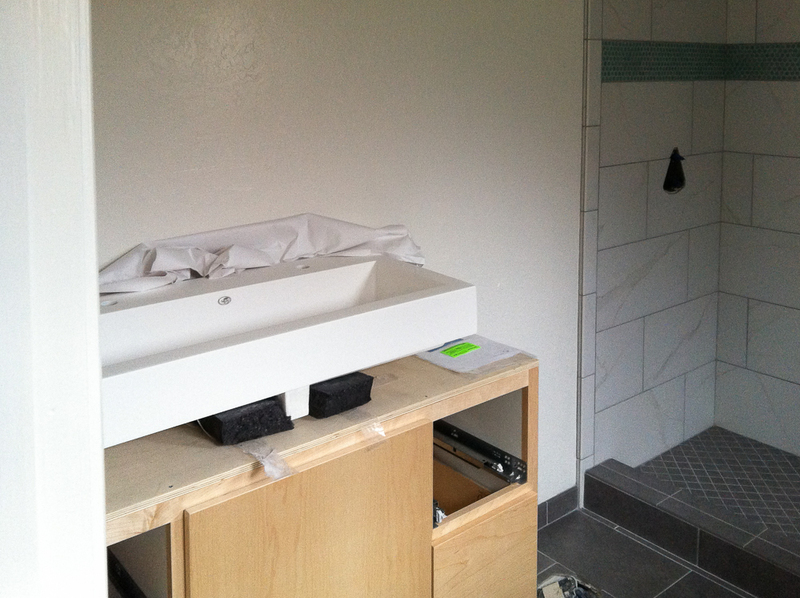 The above photo shows our Master Bathroom trough sink that we chose because the vanity will not fit two sinks. I’m pretty sure we can do it. I’ll just have to find ways to store things so they are easier to find in the cabinet. I will probably also pare down quite a bit of our stuff. The above pretty little sink will be in our main bathroom. I fell in love with the lines…square and round at the same time. Counter-top will be the same white as in the kitchen. And here is our kitchen sink. 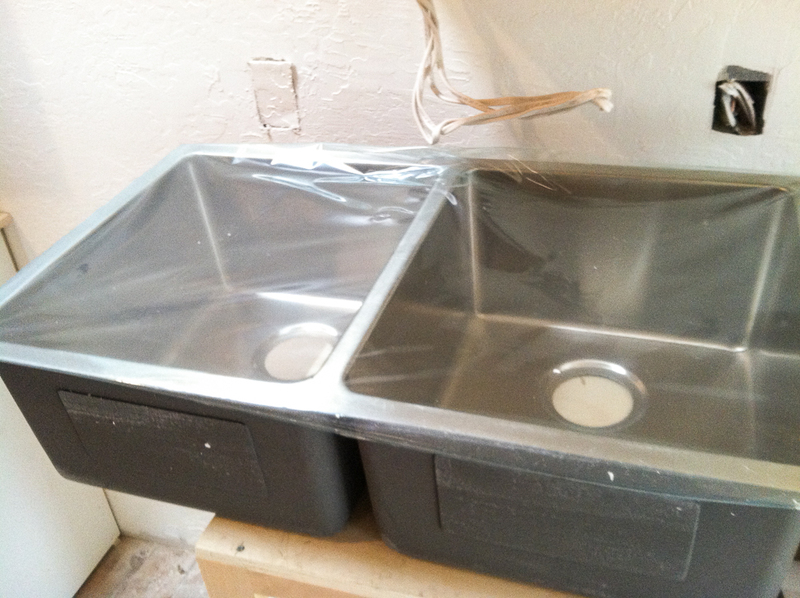 We will only have one sink in the kitchen, so we picked this one that, I hope, will compensate for the lack of a prep sink. This will also mean that we can no longer use half of our kitchen sink for the dish drainer, like we do now. More use of the dishwasher and drying dishes and putting them away after washing them (what a concept!) will be the new, tidier us. 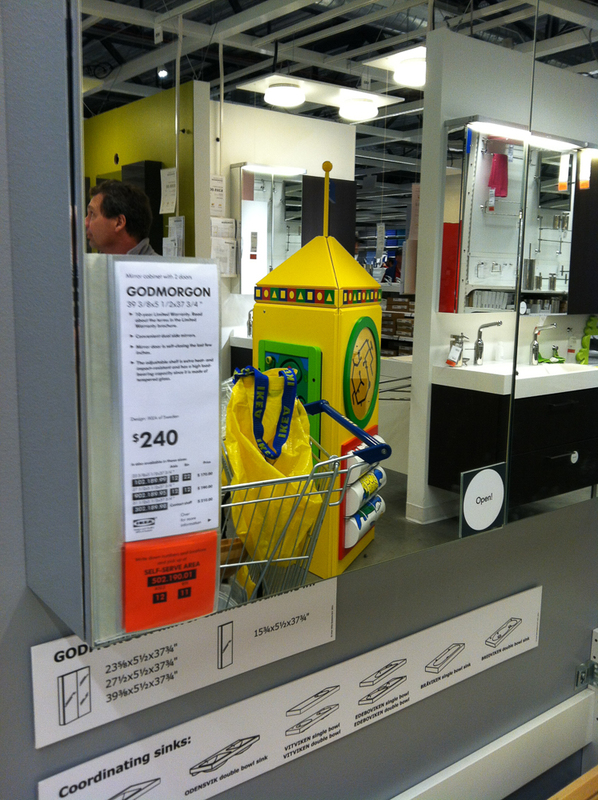 Yesterday I went to IKEA again with my daughter to look at bathroom accessories, mostly. 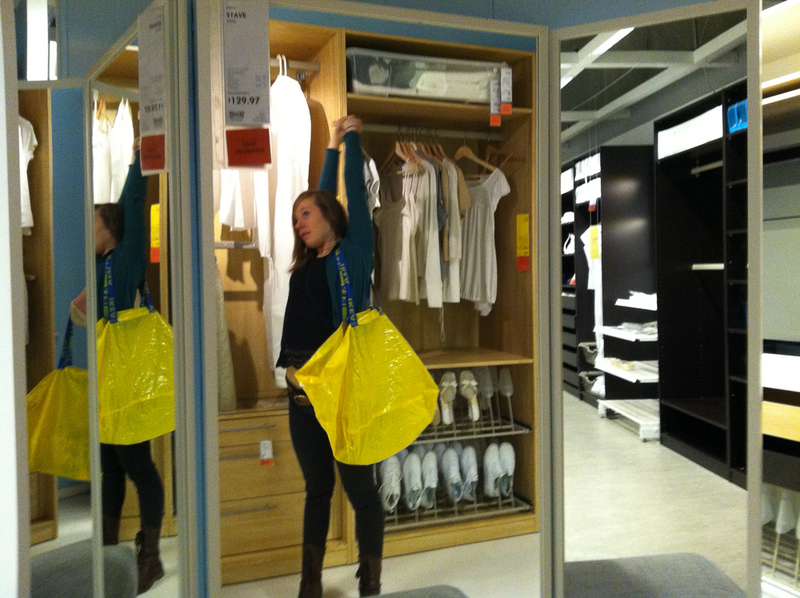 I also wanted to check out the closet storage possibilities. We found some possibilities, but I need to make sure I have exact measurements in the bathroom, especially between the backsplash and the light fixture. 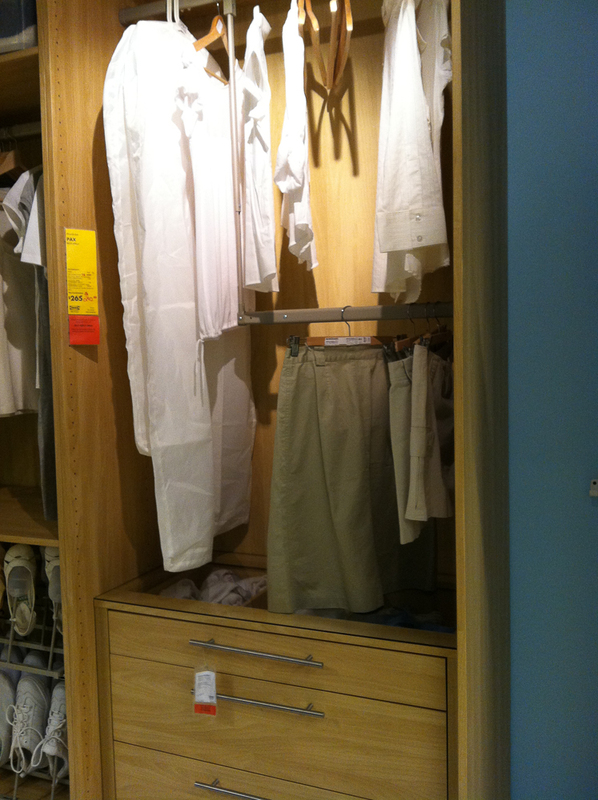 Same for the closet. I would hate to order all this stuff and have it not fit. I also picked up some new linens for our bedroom, some new plates, and a round mirror for the main bath. The jury is still out on that one. I stopped by the house yesterday to drop off all my purchases (no sense in taking them to my house just to take them back to the remodel when we move.) 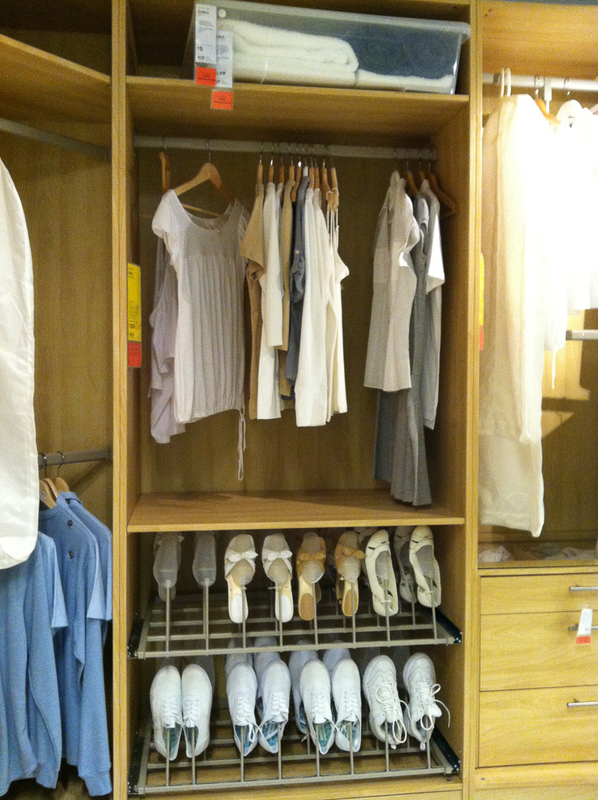 When I walked in the door and looked around it looked so clean. 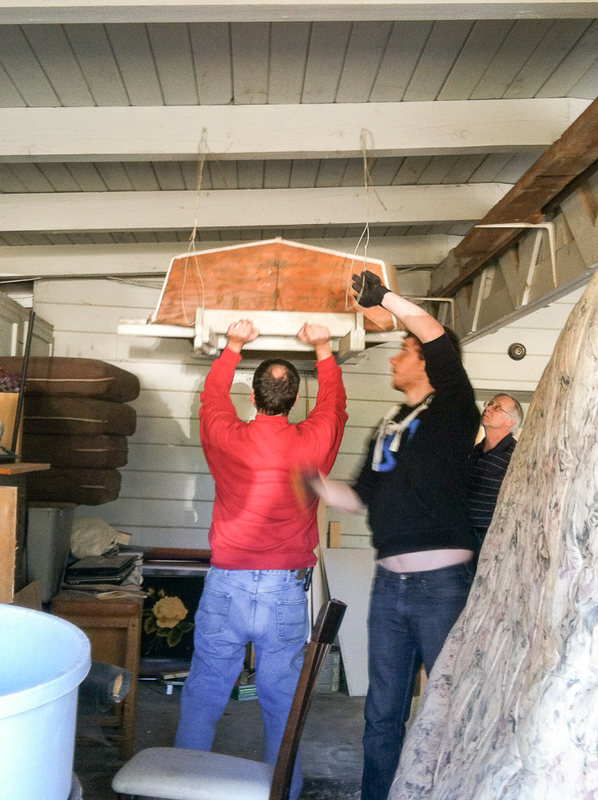 There was a closet door set up on the saw horses where my husband was painting, but the counters were totally clean. I remembered that the counter-top guy had been there to template the counters and sinks. No kitchen sink in the kitchen. No bathroom sink in the main bathroom. No trough sink in the master bathroom. No sinks anywhere in the house. No sinks anywhere in the carport. My husband texted me about something or other, so I responded and then added: Sinks are missing. Me: (not going to give him a smart aleck answer) yes, and they are not there. Me: yes, and they are not there. Him: Did you look in the carport or in the office or in the other closets? Him: Did the counter-top guy leave a note? I spied an envelope on the counter and opened it. Me: Just a bill. No note. 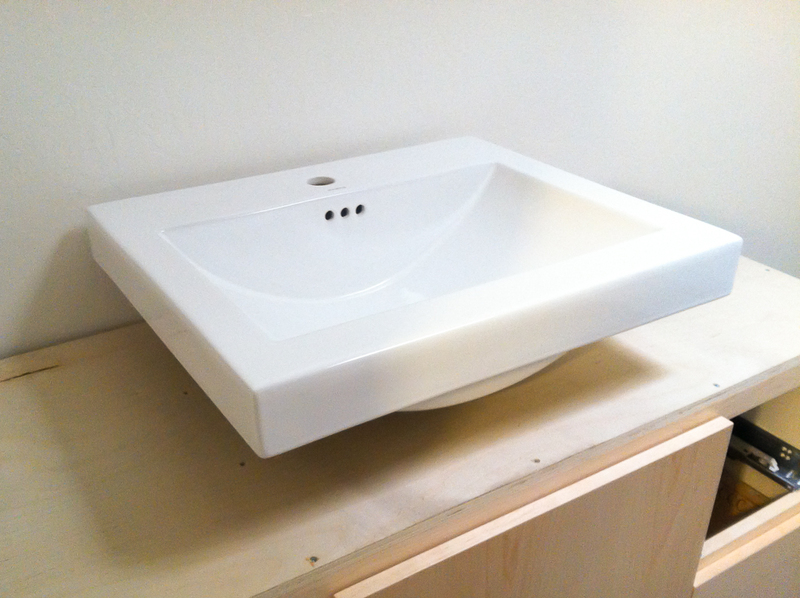 It turned out that the counter-top guy had taken the sinks and just forgot to tell us…or ask our permission. Another reason to deal with a local guy…we know where they live and they are easy to get to. I asked my brother if he wanted to get our family sailboat, Carrie. We both learned to sail on Lake Tahoe in this little boat. 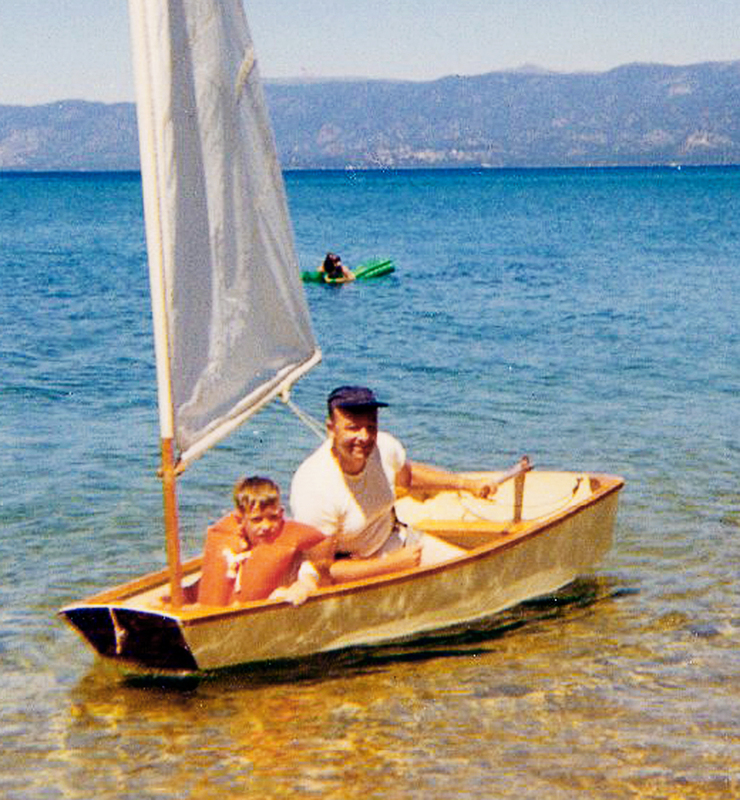 I don’t have a picture of me in the boat, but here’s one of my dad and brother sailing along on Lake Tahoe. There’s a lot of sentimental value in that little boat, so I’m glad my brother and nephew will get some use out of it. 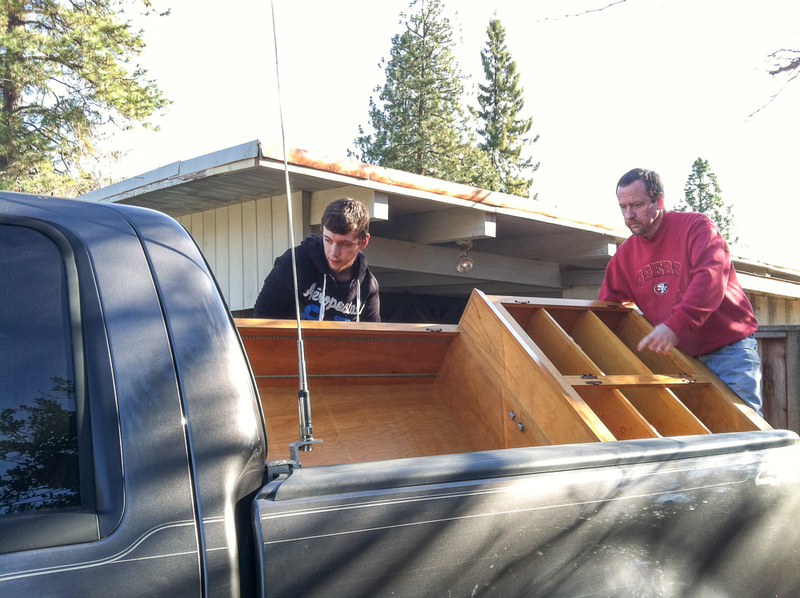 They also took the large pine cabinet that was in the family room. My great-uncle made it for my grandmother and then my mom inherited it from them. It’s been in the house since the 1990’s or so (maybe before), and the hubster and I were not going to keep it. I am so glad that it will remain in the family. So, that’s all the excitement for the last couple of days. I will pick out the floor this week and get that process started. The floor guys think they can install in about 2.5 weeks. I would like them to at least install the carpet so that we can start moving some things in. This entry was posted in Accessories and furnishings, Bathroom, Kitchen and tagged bathroom, carpet, family heirlooms, kitchen, sailboat, sinks, trough sink. Bookmark the permalink. Can I ask where you found your master bedroom sink? I’ve been looking for the exact thing…your blog came up on my search but as far as I can tell you didn’t reveal your source. Thanks in advance! Hey, Rachel. We got all of our plumbing fixtures here:https://www.ferguson.com. We have an outlet in Placerville, but I’m pretty sure they are nation wide.